Well there certainly has been a lack of pumpkin beers available this year. I have been looking every time I go to get beer. I guess it is so popular that distributors and stores can’t keep it on the shelves. The past few years I have been able to get a bunch of different kinds from breweries all over the place. This year I have had only a few! I was very happy when my friend Janeen brought me some Dogfish Head Punkin Ale. This is my number 1 favorite pumpkin beer! I thought I was going to miss out on it this year because I could not find it anywhere. We had a crazy snowstorm yesterday, so here’s the punkin ale next to my snowy pumpkins. Good thing it’s a really good beer to enjoy in the cooler weather. Punkin ale is a brown ale with real pumpkins, brown sugar, allspice, cinnamon and nutmeg. It’s much lighter in color than other brown ales but it has big bold flavors. It’s perfect to pair with fall comfort foods. It is really well-balanced and does not have that overly spicy pumpkin pie flavor. I think it is awesome! It definitely gets my pick as the best of the pumpkin beers every year. I think they is my favorite punkin beer because it has nutmeg in it. I love nutmeg – It’s my secret ingredient in some of my pasta sauces, it is great with greens like kale, and I like to add a little into some of my treats when I bake. The brown sugar also adds a little something special to this brew. 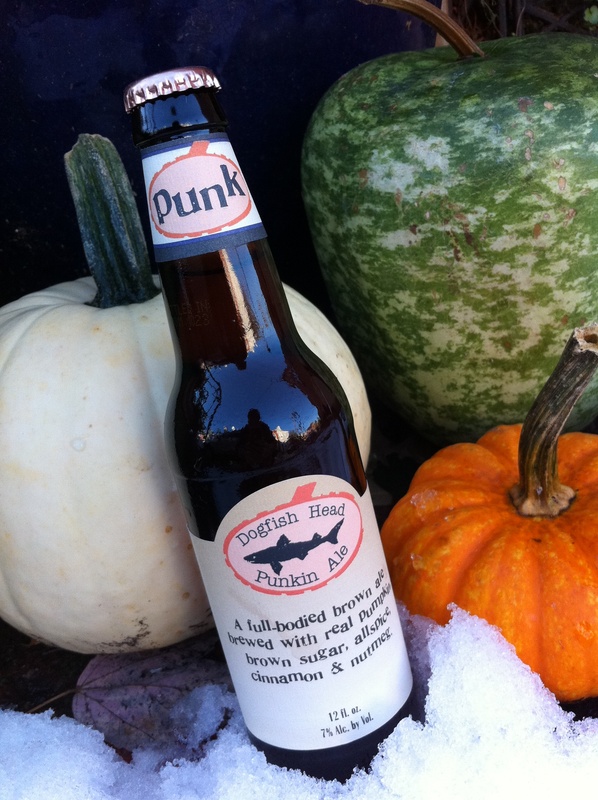 Punkin Beer was originally made for the Punkin Chunkin event that takes place in Delaware every year. You can check out the event on the Discovery Channel website. I hope you can find this pumpkin beer this year if you haven’t tried it yet. Good Luck!